ikat bag: Mystery Party Printables! Do you remember this Mystery Party from three summers ago? 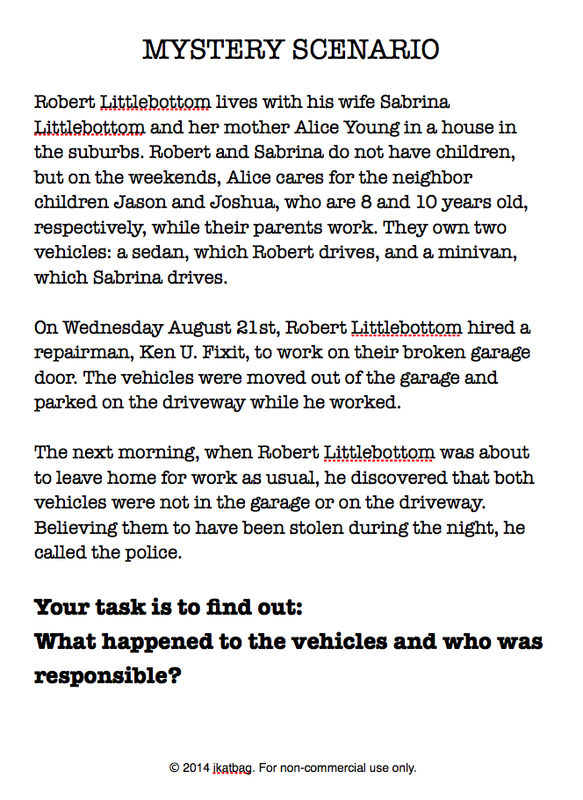 who solved coded messages and collected incriminating evidence against four suspects and then went on a hunt around the neighborhood to locate two missing vehicles? 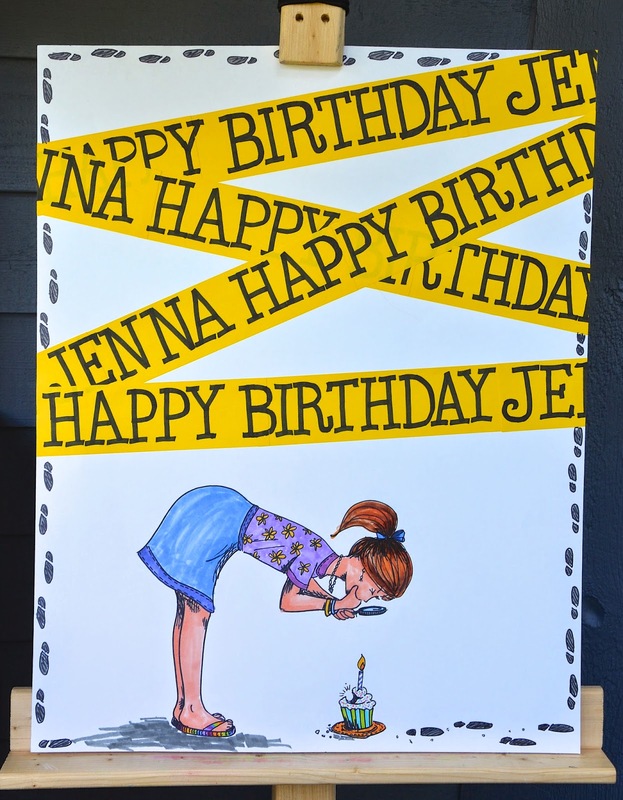 It was three years ago when Jenna and I sat down to plan this party and adapt her incredible ideas for an afternoon of practical (and feasible!) mystery-solving with her friends. Since then, many people, including parents and teachers, have written to ask if I would share the various documents and materials from this party. I'd said no each time, and eventually even had to update those original party posts to explicitly say so. I explained: one - privacy reasons. 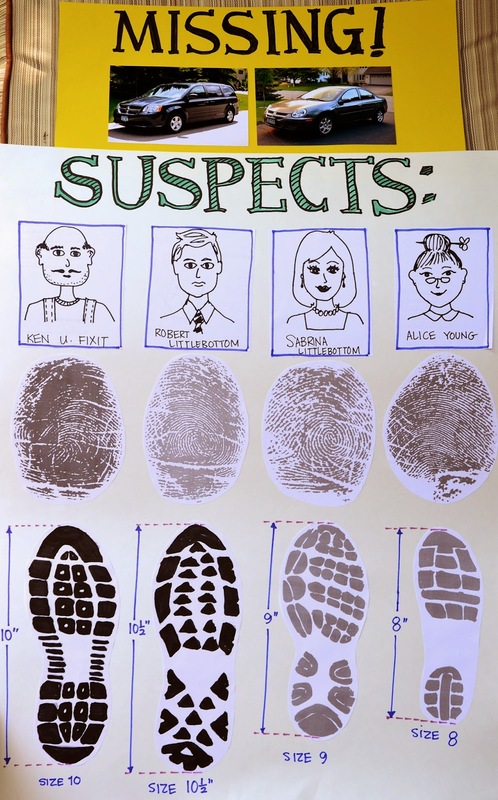 All those fingerprints, toeprints, handwriting, shoe sizes, cars, neighborhood maps, photos of neighbors' houses that we used in our documents belonged to us or people we knew personally. Two - after observing how the party was received by real kids under a real time limit, I realized that the original material needed tweaking, if not to iron out the kinks and copyright issues, then at least to streamline the material. But we'd moved on from that party, and I didn't have the time to revisit and revise all those documents. But people continued to ask. And in the wake of Emily's Harry Potter party, I thought, "Well, okay. Maybe it's possible. Maybe it won't take me five hundred years after all." So after our Singapore trip, I unearthed all the old material, removed all the personal and legally-iffy stuff, tweaked the awkward bits, wrote a brand new Mystery Synopsis without loopholes (one hopes), and added instructions on how to use the materials. Here is a page from the Instructions section detailing how this resource pack can and can't be used. Essentially, if you purchase a copy of this resource pack, you can make as many copies as are needed to run a party, or a classroom lesson (and repeat as necessary for future lessons with future classes). However, you may not share your copy; colleagues, parents, friends etc. 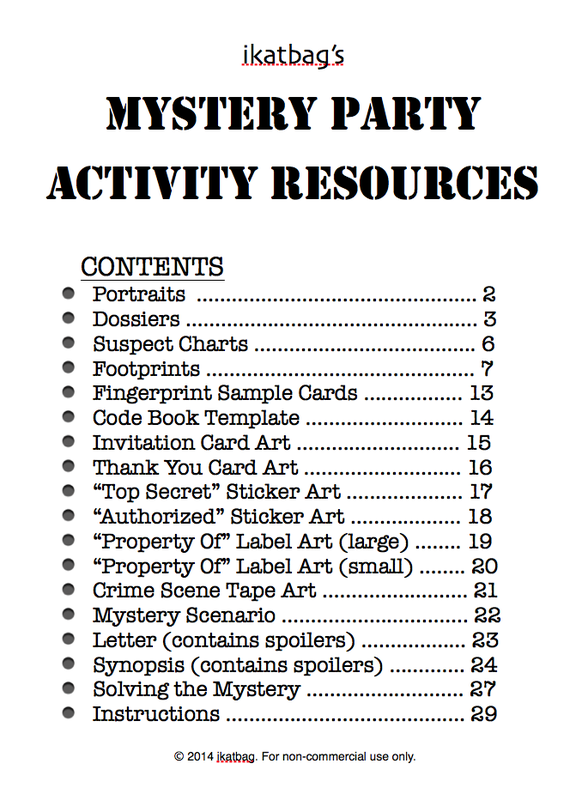 who want to run the activities in their classrooms and parties will need to purchase their own copy for use in their respective settings. 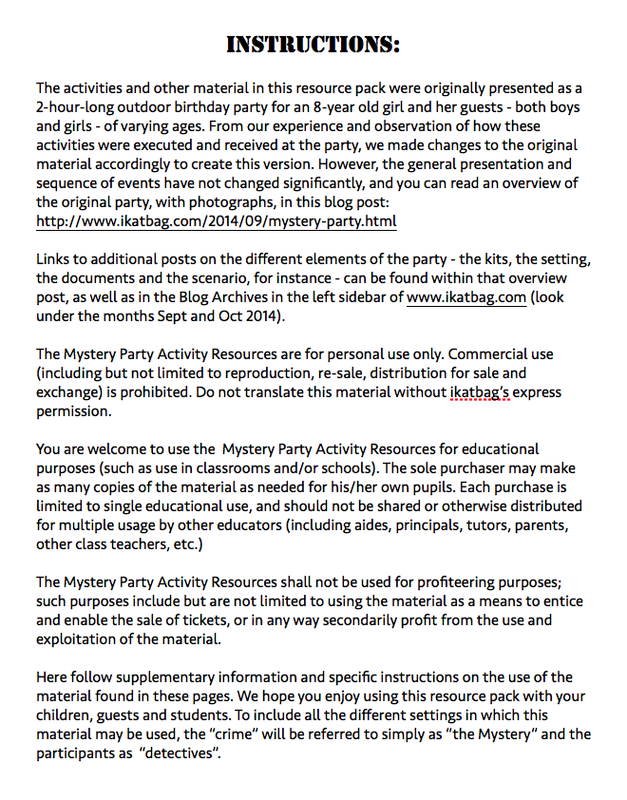 Here's another page from the pack to show you how you might introduce this activity at your event. At our original home party, we verbally explained this scenario to our guests, but perhaps that a proper Mystery Scenario might help you present the aims and goals of the activity in a more systematic way. The cost of the resource pack is $10 and you can go here to buy it. This is an instant pdf download, so be sure to save the file on a device from which you can access it later to print. If you have any questions, leave a comment or shoot me an email! So cool! 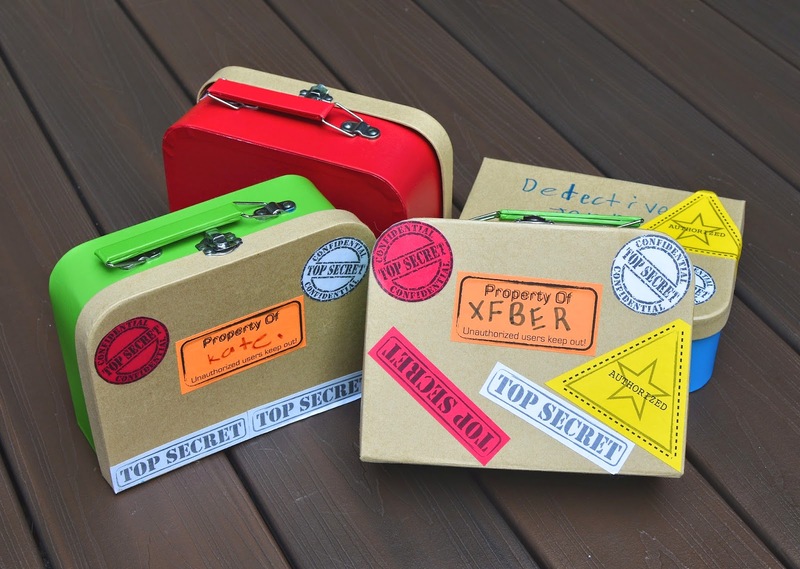 The kids are into mystery solving at the moment, so we may get to use this for a future party. Thanks! You are so talented, seriously! I wish I could plan parties like you do and sew like you do!!! Thank you for sharing your talents with us!